Let’s face it. No one likes to be called “thin skinned,” an idiomatic expression for people who can’t accept criticism and are quick to take offense. Jim Greene, however, is more concerned about the literal meaning of thin skin, the actual thinning of the skin as people age. “It’s an overlooked and silent killer,” said Mr. Greene. “The most important function of the skin is to form a protective barrier between the ‘inside’ and ‘outside’ of you. When skin becomes thin, it loses the ability to fight back. As principal scientist for Cooperlabs, based in Ventura, Mr. Greene was instrumental in creating a formula to preserve the skin’s protective barrier function with several products that are called Cabot P.O.L. Phospholipid Cream and Lotion. “Topical phospholipid therapy, which is supplied by the cream and lotion, supplements the skin to help prevent the lost of and restore the fatty layer that safeguards our blood vessels against injury,” said Mr. Greene, 70, during a phone interview from his home in Sunnyvale. “As we age, the fatty, lipid substances, as well as the layer of fat in our skin, diminish. Collagen and elastin, which support our skin structure, weaken, and our skin becomes thin, crepey and saggy. All of this leads to the loss of the protective fatty layer that we had when we were younger,” he pointed out. Mr. Greene, a native of Wilmington, Ohio, has worked on the “formulation of personal care products” ever since he earned bachelor’s and master’s degrees in chemistry from the University of Cincinnati in Ohio. “That was shortly after dinosaurs became extinct,” he quipped. For 10 years, he worked for the Andrew Jergens Lotion Co. in Cincinnati, followed by stints with Elizabeth Arden cosmetics in New York City and Indianapolis, Amway in Grand Rapids, Mich.; and Vipont Pharmaceutical in Fort Collins, Colo., where he did research on treating peridontal disease using natural ingredients. Mr. Montgomery, 85, now lives in the Santa Ynez Valley. “It was mainly used in long-term care facilities to treat the elderly who had bed sores and other conditions related to aging,” Mr. Greene said. After Mr. Montgomery’s Italian pharmaceutical company acquired the only product in the world using this proprietary ingredient, Mr. Montgomery began distributing samples to nurses and doctors in Santa Barbara and throughout the United States. The products, which include Cabot P.O.L. Phospholipids Cream, Cabot P.O.L. 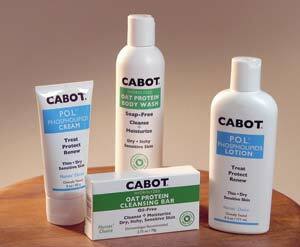 Phospholipids Lotion, Cabot Oat Protein Body Wash and Cabot Oat Protein Cleansing Bar, are available at pharmacies and health care businesses across the country. Locally, the products can be purchased at Shepard Place Pharmacy in Carpinteria, San Ysidro Pharmacy in Montecito and in Santa Barbara at Master Medical Supply, L.M. Caldwell Pharmacy, Federal Drug and Sansum Clinic Pharmacy. “Today, more than ever before, our skin’s health is being challenged. We need to get the message out that maintaining skin health goes far beyond beauty. It even goes beyond sun exposure. Maintaining skin health helps ensure our overall health,” stressed Mr. Greene. “Every day, limbs are lost, and serious. life-threatening infections occur because of compromised skin health. As we age, our skin is at risk, Phospholipid therapy works on the skin to maintain and rebuild the body’s ability to preserve its healthy, normal structure,” he added. • Sansum Clinic Pharmacy, 17 W. Pueblo St. Santa Barbara; 682-6507. For more information, call 408-813-6981 or visit www.cabotskincare.com.